Pradhan Mantri MUDRA Yojana (PMMY) is a scheme launched by the Honorable Prime Minister on April 8, 2015 for providing loans upto 10 lakh to the non-corporate, non-farm small/micro enterprises. 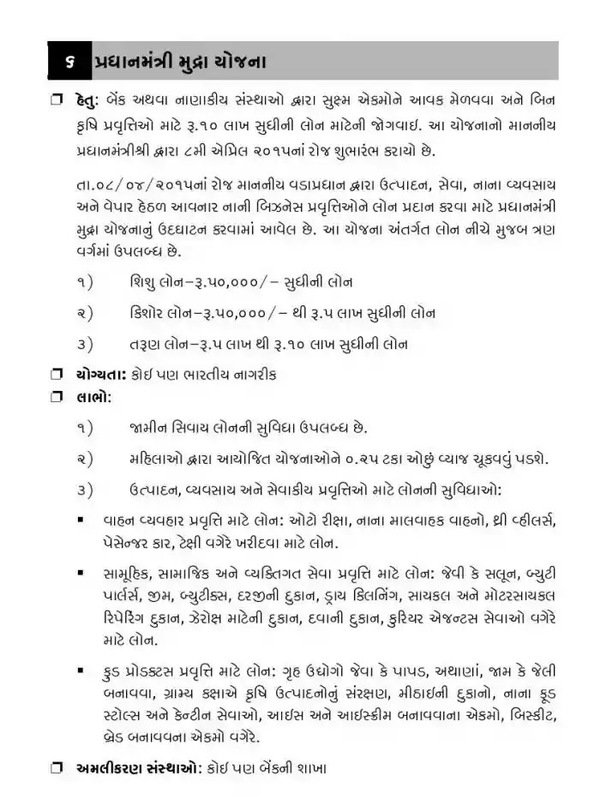 Gujarat State Also Available PMMY. To get revenue from banks and financial institutions, and non- Provision for loan of Rs. 10 lakhs for agricultural activities. Honorable of this plan The Prime Minister has given an undertaking on 8th April 2015. Production, Service, Small Business by Honorable Prime Minister on 08/04/2015 And to provide a loan to small business activities coming under the business, the minister The scheme has been highlighted. This plan will be a three-way loan below restless loan Available in the ward. 1) All loans are available without bail. 2) The schemes covered by women will be paid 0.25 percent less interest. For the production of food products, the loan is available for home business. Creating, protecting agricultural products at village level, confectionery, small food Stalls and Canterbury Services, Ice and Ice Cream Making, Bubskit, Bread making units etc.